Scrubber tower for pollution control system. Air pollution is bad. You can quote me on that. I vividly remember as a kid driving through the industrial hellscape of Gary, Indiana, on our journey to Chicago. We had no air conditioning in our 1969 Chevy station wagon, but my mom insisted we roll up the windows to keep as much of the toxic gas out of the car (and our young lungs) as possible. That didn’t work all that well. Anyhow, check out photos on the internet of Gary in the 1970s. It’s pretty unbelievable! Fortunately, air pollution control has come a long way since President Nixon first established the Environmental Protection Agency (EPA) in 1972. 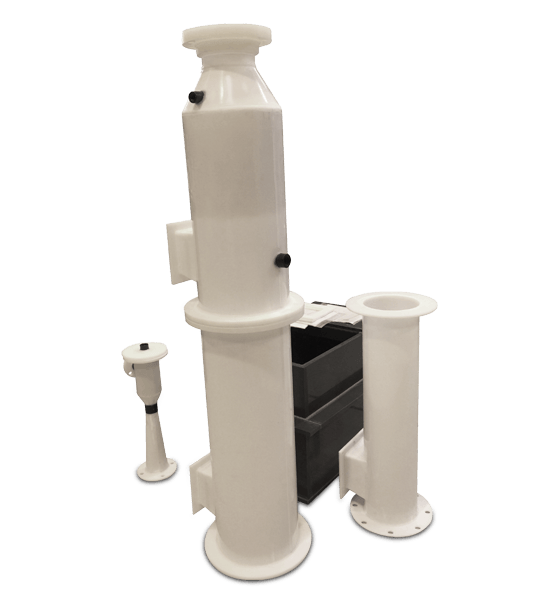 We worked with a local pollution control equipment manufacturer to build a Scrubber Tower entirely from polypropylene sheet, tube and coupling. It is a small but important part of a much larger pollution control system. Cleaner air means everybody wins! If you drive through Gary today, the air is remarkably cleaner. We are happy to be part of making our planet a cleaner place.